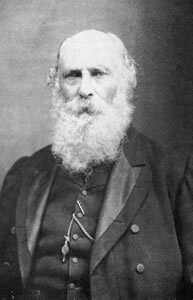 George Johnstone Stoney (1826-1911) was born in Oakley Park, Co. Offaly and was one of a group of Irish scientists who made significant contributions to the study of spectra, that is the light of various colours emitted or absorbed by different substances. Stoney was educated at Trinity College Dublin and became an assistant Professor at Lord Rosse's Observatory at Birr. He was later appointed Professor of Natural Philosophy at Queens College Galway and after that moved to Queens University in Dublin, where he held the position of Secretary of the Administrative Headquarters of the Queens Colleges. Stoney's most important scientific work was the conception and calculation of the magnitude of the atom or particle of electricity, for which he coined the term "electron". He also estimated the number of molecules in a cubic millimetre of gas, at room temperature and pressure, from data obtained from the kinetic theory of gases. Similar determinations of this quantity, which is equivalent to Avogadro's numbers, were made independently by other great scientists, J. Loschmidt of Vienna and the renowned William Thomson. Willaim Thomson later became known as Lord Kelvin. As early as 1874 Stoney had calculated the magnitude of his electron from data obtained from the electrolysis of water and the kinetic theory of gases. The value obtained later became known as a coulomb. Stoney proposed the particle or atom of electricity to be one of three fundamental units on which a whole system of physical units could be established. The other two proposed were the constant universal gravitation and the maximum velocity of light and other electromagnetic radiations. No other scientist dared conceive such an idea using the available data. Stoney's work set the ball rolling for other great scientists such as Larmor and Thomas Preston who investigated the splitting of spectral lines in a magnetic field. Stoney partially anticipated Balmer's law on the hydrogen spectral series of lines and he discovered a relationship between three of the four lines in the visible spectrum of hydrogen. Balmer later found a formula to relate all four. George Johnstone Stoney was acknowledged for his contribution to developing the theory of electrons by H.A. Lorentz , in his Nobel Lecture in 1902. It was Lorentz who actually developed the theory.A practical man, as well as a theorist, Stoney invented a novel form of heliostat. This is a scientific instrument in which a clockwork mechanism controls the movement of a mirror so that, when sunlight is reflected from the mirror for use in scientific experiments, the ray of light stays still rather than moving as the earth revolves. George Johnstone Stoney was an educationalist and a physicist, whose ideas and conceptions were far ahead of his time. Irish Innovators in Science and Technology. Published jointly by the Royal Irish Academy and Enterprise Ireland it is an updated and enlarged version of the two-volume People and Places in Irish Science & Technology published in 1985 and 1990. The book is edited by Charles Mollan, William Davis and Brendan Finucane and it contains biographical information on 155 men and women who have contributed to Ireland's scientific heritage. J.G. O'Hara: George Johnstone FRS and the Concept of the Electron, Notes and Records of the Royal Society, 29 (2), 265-276, 1975. Alex Keller: The Infancy of Atomic Physics: Hercules in His Cradle, Oxford University Press, New York, 1984. J.G. O'Hara: George Johnstone Stoney and the Conceptual Discovery of the Electron, Occasional Papers in Science and Technology Eight: Stoney and the Electron, Royal Dublin Society, 5-28, 1993.